Huntsman spider, photographed at Green Cay Nature Center in Boynton Beach. Note this guy is missing a limb and part of another. The huntsman, Heteropoda venatoria, isn't the most socialable of spiders, but it's no recluse either. 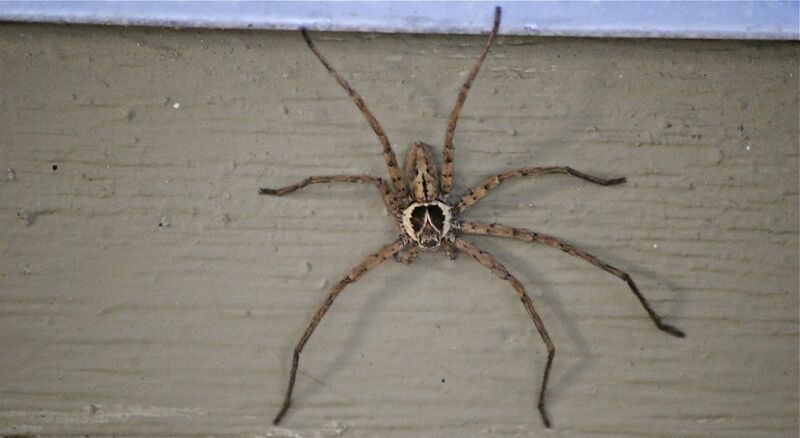 Please forgive the pun, but the huntsman is often mistaken for the brown recluse spider. 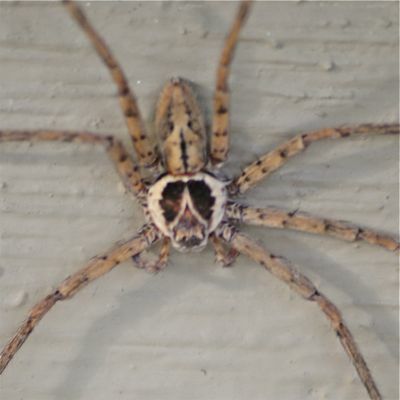 In fact, we heard a few observers call the spider pictured here a brown recluse. It most definitely is not. The brown recluse isn't related and doesn't really look anything like the huntsman. The flattened body, long legs with their distinctive black spots, the black border around the head, the stripe that appears to be extending from head down the abdomen all say huntsman, and probably a male at that. Members of Heteropoda are among the largest spiders in the world. They hail from Asia. 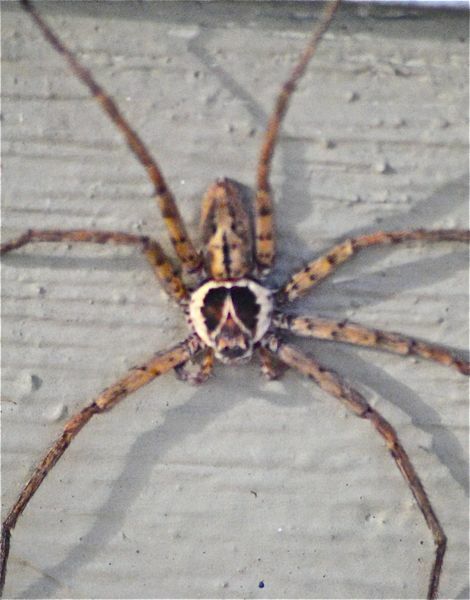 The huntsman found in Florida, H ventoria, has a body length of about an inch and a leg span that can hit five inches. Females are larger than males. The huntsman is not native to Florida, but how and when it got here is not known. It does not tolerate cold weather, and in places where freezing temperatures occur, it is unable to survive in the wild but will seek shelter in homes, sheds, barns and other places where it can find a crack or crevice for shelter. South Florida, South Texas and Southern California are balmy enough for the huntsman to be an outdoorsman. In its apparent homeland, the huntsman are prized, because of their habit of dining on cockroaches and other indoor pests. It doesn't spin a web to trap a meal but rather relies on speed and powerful mouth parts to catch its prey. It kills by injecting venom into its victims. To humans, however, they're pretty close to harmless, although they will give a locally painful bite if mishandled in any way. Females carry their eggs in a sac under their bodies. The sac can have 200 or more eggs. The presence of an egg sac can make huntsman females to appear to be immobile. Huntsman are also called giant crab spiders, housekeeping spiders and banana spiders, because they're commonly found on the fruit. It is a member of Sparassidae, a family of more than a thousand spiders, although some put it in Heteropodidae.